This special presentation of "Trying," is a fundraiser for the Richmond Hill Garden & Horticultural Society, made possible by The Curtain Club. Ticket sales were brisk at our September 6th General Meeting, but a limited number of tickets are available to members, guests, and the general public. Click on the "Register" button to the left. Tickets are $15 apiece, a $7 savings as compared to future performances. “Trying” depicts differences between two people who are trying to understand each other. 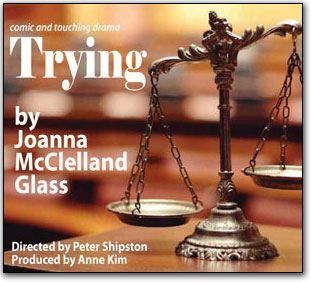 Joanna McClelland Glass wrote the play while working for a judge who was the former Attorney General of the U.S.A. and Chief Judge of the Nuremburg trials.